would not feel excluded. Not only was there a great variety of music, but the performers were very creative in how they presented their music. It was inspiring: the kind of experience that you'd hope to have when you're first starting out, seeing great new possibilities for making music. It seemed that the focus was more on what people had to say than what they had to sell. Thanks to all the people who made that experience possible. I felt new again. 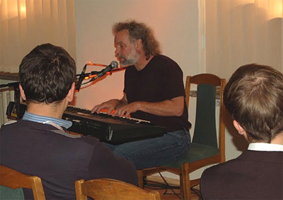 One of the most prominent international šiumecio singing poetry festival "It's - I was guest - an American, John Gorka. 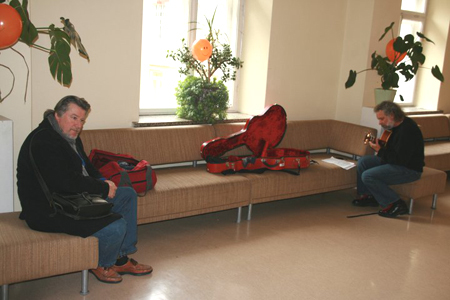 Bardo adventures started even before they arrive in Lithuania: the Amsterdam airport, lost in his guitar, but yesterday, the artist borrowed instrument appeared to medium Festival concert. Today, and two weekend concerts he also spare no attention to the audience. John his first guitar as a child received a Christmas gift, but it soon "seizure" older brother. The future of this great bard nesisielojo and found a way - learned to play banjo. Even more seriously interested in studying music - he started playing in clubs and related issues in their music programs. Folklore Festival for the first time she sang in 1984. And since such a success. 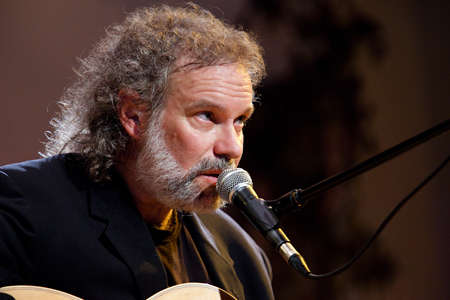 During his career Mr Gorka played folk music with such stars as Suzanne Vega, Shawn Colvin, Michael Manring and others. 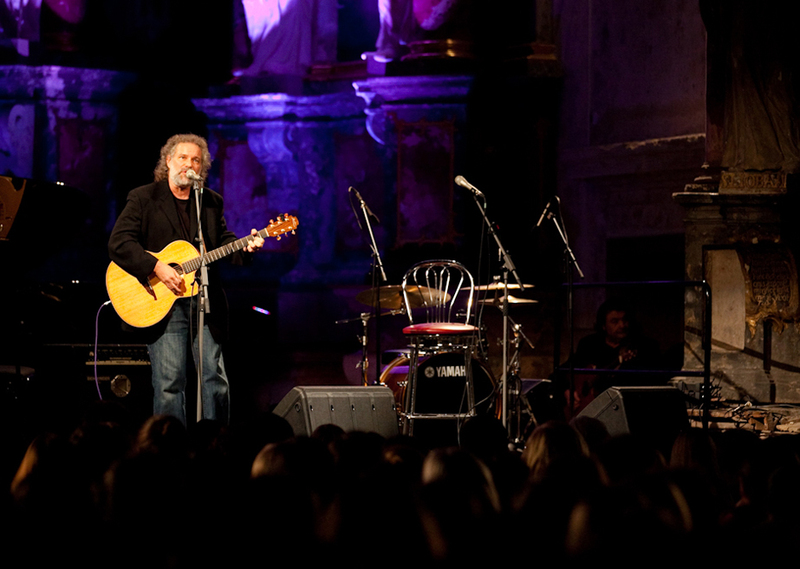 He has released 14 albums, many concerts not only in the U.S. and Europe. John as a respected tradition of folk music promoter. His music free from fashionable trend or whim. 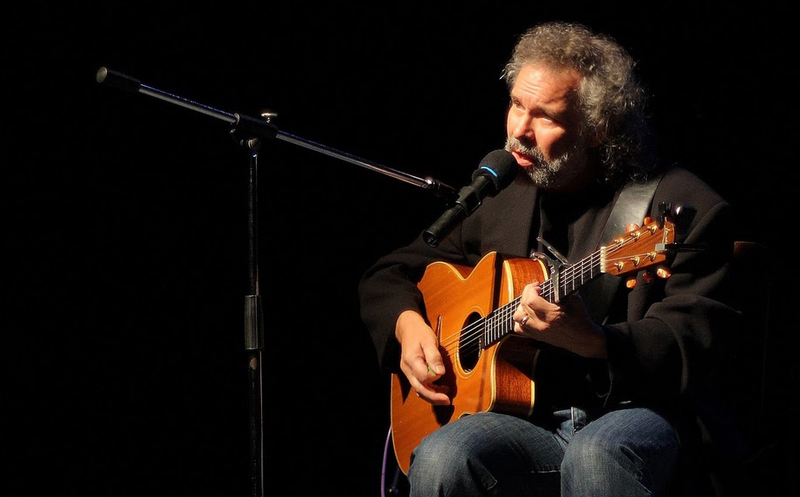 Musician finds creative fans of romantic poetry and the coherence of the observed details. 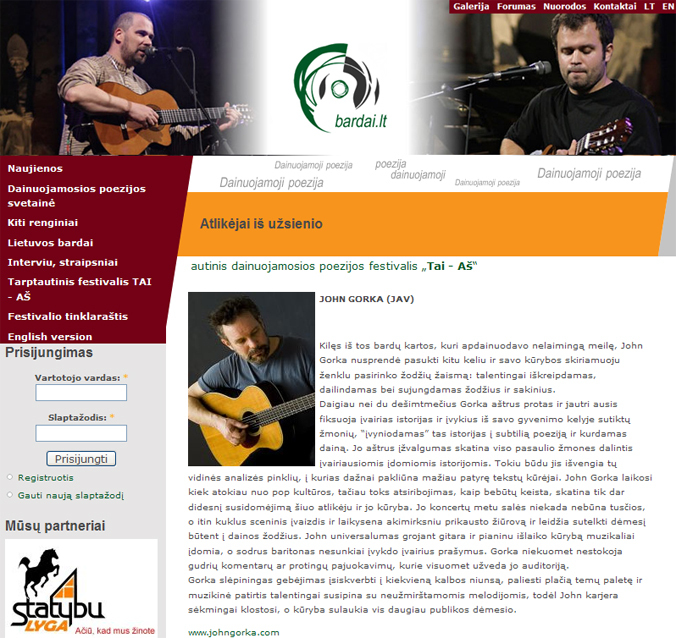 Singer is very busy, but Lietuvos Žinios managed to contact him before the trip to Lithuania. -You have no shortage of concerts, however, decided to attend the festival held in Lithuania? - I was very eager to get before, because land was completely new to me, never thought to go here. This trip really made me very happy. It is fun to play not only for people who have heard my records, but those who do not know what I'm like that. Appearances in the new, unexpected places - great surprises of life. -What you have heard about the festival "It's - I? - Nothing, I learned about it only invited to participate. Very surprised when he saw the festival that it will participate in as many performers from different countries around the world. Very excited to meet them all and hear their music. 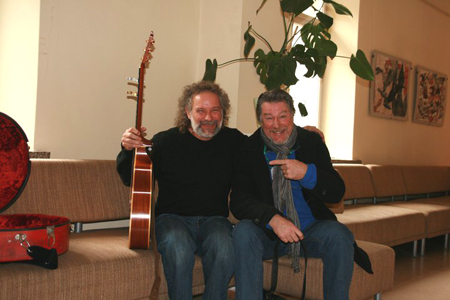 - Have ever heard sung in Lithuanian poetry, maybe you know our bard? - No, I'm unfamiliar with the works of Lithuanian, so the fun will begin acquaintance face to face during the festival. - How long do you plan to spend in Lithuania? 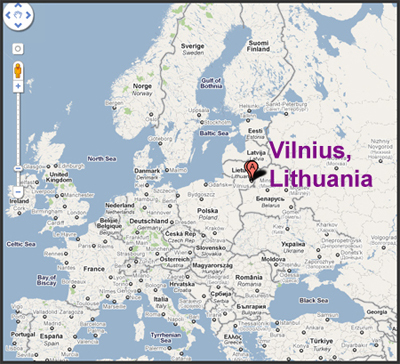 - This is my first trip to Lithuania, and I study in this visit in Estonia. 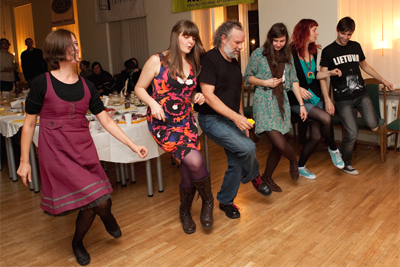 Your country would spend four days in their hope to see more access to culture. And, of course, try the traditional dishes. - What do you know about Lithuania? Maybe the U.S. know Lithuanian? - Very little I know about your country. Only in so far as a student he had read. Of Lithuanian also not met, but my manager David's grandfather and grandmother are from Lithuania, though both he and his father was born in America. - A total of four concerts. - Do you have a gap where the play: the U.S. or Europe, in a small club or a large hall? - Concerts in Europe must realize that maybe not everyone understands English perfectly, so my feelings as a performer is more pronounced tone of voice, music, gestures, but at the same text ... Just a little bit differently interact with the audience ... As for the concert, I enjoy all. Of course, smaller and more intimate space provides a warmer atmosphere. 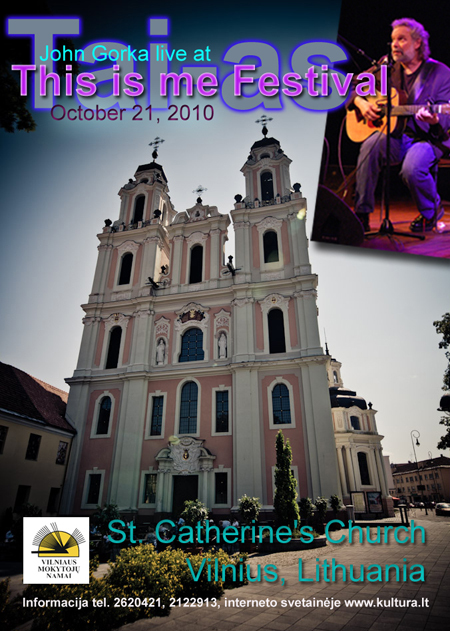 - Lithuania and festivals in the church. 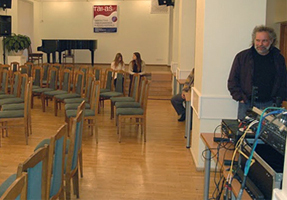 Have you previously had the pleasure to perform in a space? - I've played in many churches. I was raised as a Catholic, and so sang during Mass. 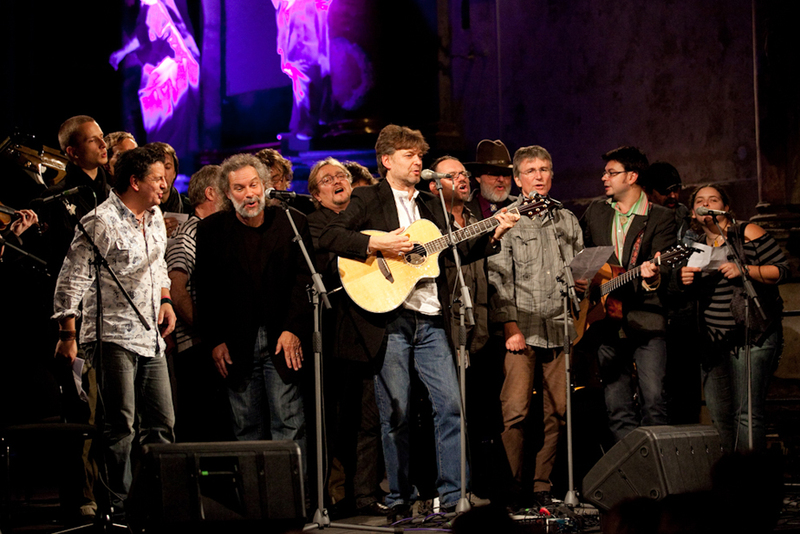 at Tai-as Festival in October 2012.